In this busy life full of work, we generally play with a lot of digital data including videos, images, documents, audio files etc. Everything is calm and peaceful until we accidentally delete something important. Data loss hurts really bad especially when it’s your office related file or a lovely memory that you captured long back ago. Then we realize the importance of having regular backups which we usually don’t care for. In such situation, having a good recovery software acts as a life savior and therefore, here we are with our list of the Best Partition Recovery Software. Major data losses occur due to a plethora of reasons including the biggest one i.e. pressing Shift + Delete without giving it a second thought, in addition to the sudden power cuts, machine failure or a file corrupted by a malware. In this case, first of all, it is recommended to immediately stop using the drive from where you have lost your data so that you can recover your precious data before its gone forever. Then you should install one of the best partition recovery software mentioned below. Note: After being contacted by one of reader we need to clarify that the softwares mentioned in this article does not recover the deleted partition but they are used to recover files in it if you have accidentally formatted the whole partition. 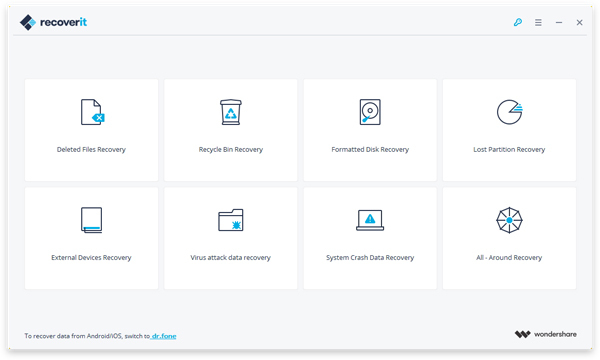 The RecoverIt Partition Recovery software by Wondershare is one of the most popular all-in-one data recovery suite, available for both Windows and macOS. It comes with a very intuitive user interface and can help you recover for all major file types, including photos, videos, music, documents and other files. It is really efficient in retrieving your data from all data loss scenarios, including permanent deletion and emptied recycle bin. The data lost due to disk formatting, external device corruption, partition loss, malware attack, system crash, machine failure etc too can be recovered easily using the software. One of the best reasons for choosing RecoverIt over other solutions is that it supports mobile device recovery for Android and iOS via Dr. Fone application which comes in really handy at times. This software can perform system crash data recovery which can be life saviour in worst case scenarios. It can also recover data from external devices like PenDrives, SD Cards, MP3 players and digital cameras and supports hard drive cloning, startup-disk recovery for non-booting computers and optical media recovery. The partition recovery process is very easy and comprises of Selecting the partition, Scanning for files, and finally Recovering the needed ones. The scanning speed is reasonably fast as per the size of your partition. 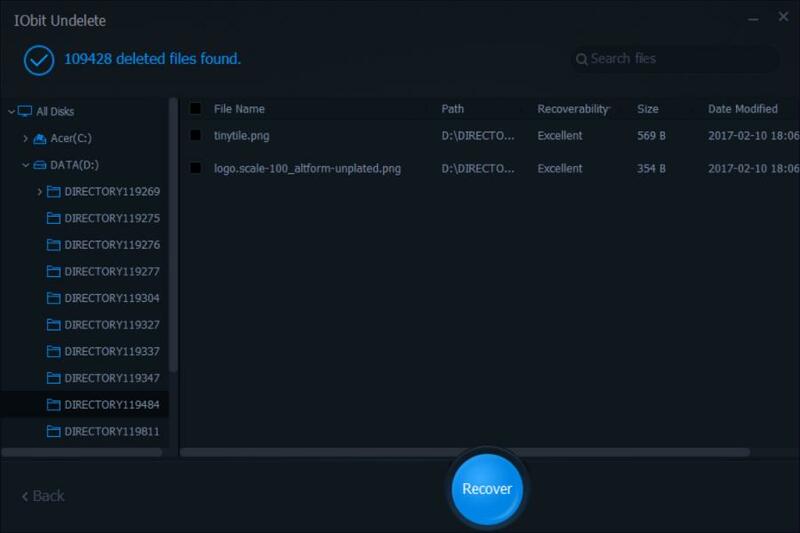 Now you don’t have to worry about whether your file is recoverable or not as the RecoverIt supports over 550 data formats, including almost all images, multimedia files, documents, emails, archives and other popular formats. Furthermore, it aids complete data recovery for all the devices with NTFS, FAT16, FAT32, HFS+ and APFS file systems. Some minor cons that we noticed here are the inability to preview files and the 100MB limit for free users i.e. to recover files having size more than that you’ll have to buy the pro version for around $40. However, the easy to use interface loaded with tons of features and good recovery rate, the Wondershare RecoverIt Lost Partition Recovery turns out to be our top pick for the best Partition Recovery Software. The Stellar Phoenix Partition Recovery Software is indeed a solid offering from a well known and trusted company. It comes with a minimal yet efficiently designed Interface and is mainly targeted towards beginners and non-technicians. This software allows the recovery of all types of files including Office Documents, Photo, Video, Emails & more even from Inaccessible Hard Drive Partitions, portable HDD, USB Sticks, Memory Cards, CD-DVD & Other Storage Devices. It suрроrtѕ FAT, NTFS, аnd ExFAT fіlе ѕуѕtеmѕ. Using the software is pretty easy, you just have to select the file types you want to recover or just leave it on All Files option and then select the drive location from which the file is intended to be undeleted from. A dedicated Deep Scan option is present too which is recommended to be used when the file system on the target drive is damaged. It supports recovering data from different types of storage devices like SD cards, smartphones, USB drives, hard disks etc. While recovering the files in QuickScan mode, it shows the proper file names so that you can identify the files, whereas, in the deep-scan mode, the software displays only generic filenames with an option to preview them. We do have an option of disk imaging for retrieving files from disk media that may be failing, without stressing the original disk media that may result in even worse failure. Moreover, it is full of advanced features and provides fast file recovery from the partition making it one of the best partition recovery software. 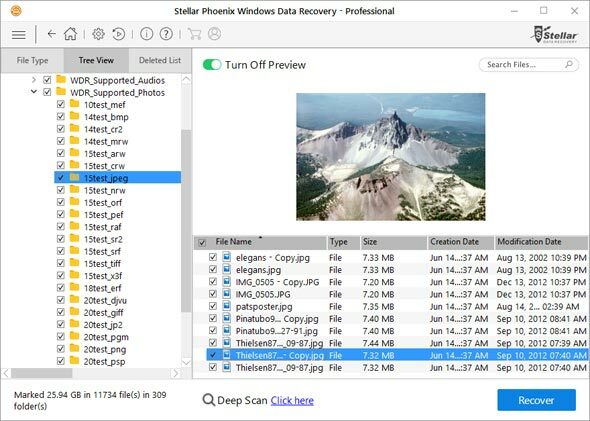 The best part is that even with the free version of the Stellar Phoenix Data Recovery, you can recover up to 1GB of data, which should be enough in most cases. If not, then get the premium version for around $60. The Recuva Data Recovery Software by Piriform has the ability to restore files from hard drives, Pen Drives, DVD or CDs, memory cards, external drives and is known for the same in Industry. In fact, it is the most reliable software when it comes to hard drive and image recovery. This software for PC can be used on Windows 10, 8, 8.1, 7, Vista, XP, and older versions of Windows too. It comes with a very basic and easy to use interface. The superior data recovery algorithms help you in recovering maximum of the lost data. Similar to the other software, this one too packs a dedicated deep scan mode, which runs slow but is more efficient than the basic scan and detects large video files which were not detected by the Quickscan mode. The main highlight of the Recuva is its ability to automatically rename the files when recovering two files with similar names, aided by industry & military standard deletion techniques. It can also rectify damaged or recently formatted files which can be previewed by the user before opting for recovery. The portable version can run from the USB stick for better convenience. However, sometimes the software claims the files to be “unrecoverable” that are still on the hard disk in the same location. It works both on FAT and NTFS systems and can be downloaded for free from the official site. The iObit undelete is quite easy to use and comes with a dark UI that you might have seen with the IObit Uninstaller or Advanced SystemCare software. Its minimal interface with separate option for each type of file recovery makes it extremely convenient for the user. You can choose between Images, Music, Documents, Videos and other types like archives etc or else leave it to default All types option. You can further specify the location of the lost files. Scan speeds are really fast but unfortunately, this software skimps on the option of the deep scan. Although the normal scan method does the job a dedicated deep scan mode could’ve been better for an in-depth scan of lost files. One interesting thing with the iObit Undelete is that it shows you an estimate of recoverability in terms of excellent or poor so that you can figure out the chances of getting a particular file back, generally, the recovery rates are good enough. Also, an eye icon is present at the right side for previewing the file before performing recovery, further adding to the user convenience. This software doesnt offer much-advanced options like the other ones but is simple, easy to use and lives up to expectations from an average consumer point of view. Data Drill by CleverFiles is one of the most advanced and trusted data recovery software in the market. this can recover deleted data from partitions and external storage devices powered by FAT and NTFS file systems and in fact, it supports other complex file systems as well including the HFS+, EXT4, FAT16, etc. The major highlights of DiskDrill which differentiate it from the competition are its Recovery Vault which adds a layer to the Recycle Bin and keeps a backup allusion to all the recently deleted files and the Guaranteed Recovery feature which keeps a copy of each file that is moved to another folder, ensuring lesser chances of getting corrupted data, resulting in peace of mind. DiskDrill not only allows you to recover images, videos, documents, audio, archives like other software do, but also provides the functionality of creating image files in the form of ISO, IMG or DMG files. As a benefit of which, the user can perform the data search in a clone, without further risking the original source. In a nutshell, this software not only helps in recovering the lost data but also protects your existing data from accidental deletion. Note that with the free version of DiskDrill, you are limited to 500MB of data recovery. For more, you have to pay a premium to get the Pro version which offers unlimited recovery along with regular upgrades. These were our top 5 handpicked choices for the best Partition Recovery Software. You can choose between either of them based on your requirements and choices. 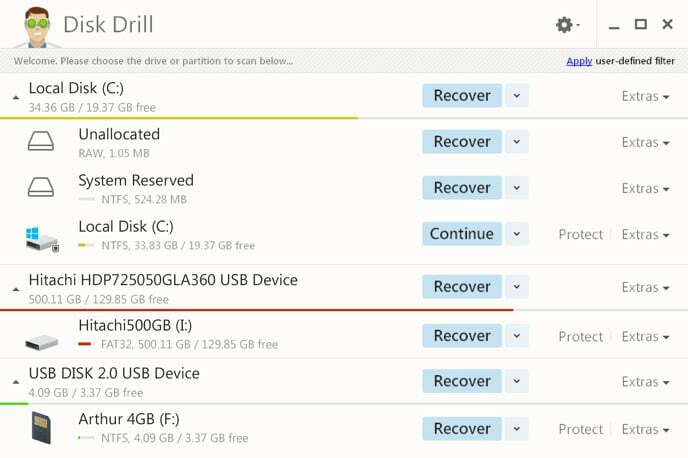 Our recommendation will be the RecoverIt partition recovery software, followed by the DiskDrill. In the end, all of them offer peace of mind and relief from the panic caused by data loss. Do let us know what’s your pick from our list of best Partition Recovery Software.